【 Faster Pre-Paint Job 】　When preparing a polycarbonate body for painting, washing with detergent to remove any oils and so forth from its surface and waiting for it to dry takes time. 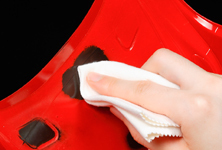 Polycarbonate Body Cleaner will save you time with this pre-painting cleaning job. 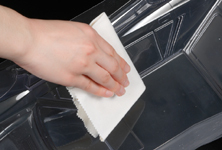 Apply the Polycarbonate Body Cleaner onto a cloth and gently wipe the surface until the dirt, grease, or oils have been cleaned off. It dries quickly so you can proceed to painting right away. 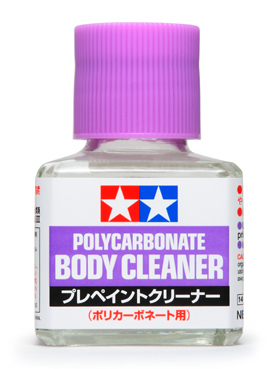 It can also be used to remove completely dried paint from the body without damaging the body surface. 1 bottle contains 40ml. Apply cleaner onto a cloth and wipe the surface to clean the body. Completely dried paint can be easily removed.